classic ruched trumpet Tara Keely wedding gown. Pictures simply do not do this bridal gown justice. This is a beautiful ivory satin dress is a bridal size 12 and features a sweetheart neckline, a trumpet silhouette, ruching through out the bodice and a unique beaded accents with a floral motif on the bust. 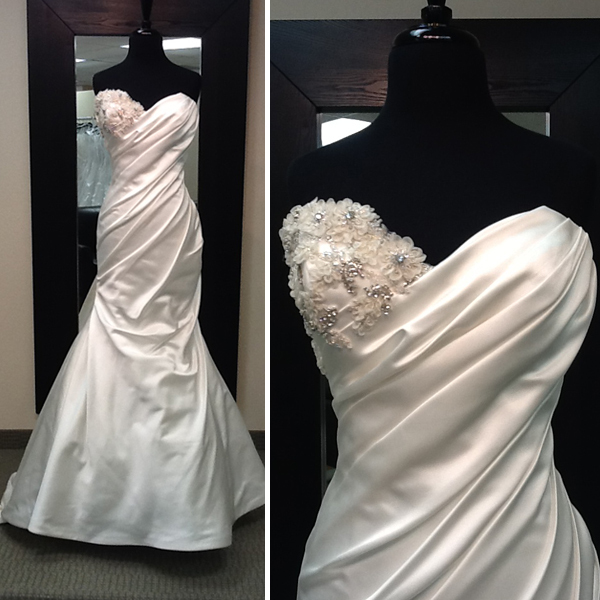 With the additional 10% off for our Dress of the Week feature, your final price is just $1435.50! Over 50% below retail for this designer wedding dress! You will not find this wedding gown at any other bridal store in Arizona and you certainly won't find it for this price. If you've been looking for a classic dress with a unique flair make sure to stop in this week to try on this gorgeous gown.